I don’t know about you, but my favorite thing in the whole house is my bed. It is comfortable, pretty, and just the right size. Wait, you don’t know what’s the right size for you? Don’t worry, I will help you pick your perfect mattress. And we will start with the sizes, of course. Let’s look at the common mattress sizes you can come across these days and see which one would be ideal for you. Interestingly enough, crib mattresses are usually firmer than regular ones. However, such a solution is quite logical. 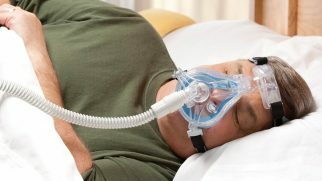 The thing is, babies aren’t able to maneuver easily in their bed, which means if they roll onto the stomach and their face sinks into a soft mattress’s surface, this can result in suffocation or SIDS (Sudden Infant Death Syndrome). Usually, crib mattresses don’t serve users for very long. Such mattress’s dimensions are suitable for kids until they reach 3 feet in height (which happens around 18 months). Therefore, such a mattress type would be ideal for babies and toddlers who are less than 3 feet tall or younger than 18 months. To fit this mattress size into a room in the most efficient way, make sure that you have enough space to walk around the crib. Considering that you might also put a changing table in the room too, your baby’s bedroom should be around 7 x 10 feet. Twin mattresses are oftentimes called Single because they are ideal for a single user. This is the smallest mattress type among the common sizes (not taking crib mattresses into consideration). Oftentimes, people confuse these two names – Twin and Single – and believe that Twin is supposed to be bigger, while Single is a smaller version of this mattress size. A Twin mattress would be ideal for children who have already outgrown their cribs, teenagers, and solo adult sleepers (petite ones, preferably). Twin beds are also a great solution for a limited living space. They can be super comfortable and provide a great sleeping environment without taking too much space in the room. However, you can’t put such a mattress just anywhere. For the most comfortable use, your room should be at least 7 x 10 feet. If you want to put two Twin beds in one room (for instance, if you have two kids), then the bedroom should be at least 9 x 9 feet. Twin XL (Extra Long) is the most popular bed size for college dorm rooms. Such mattress dimensions are ideal for smaller living spaces while still providing some extra length for teens and college students. It is narrow enough to allow for some extra space for a desk (which is a necessity in a college dorm) but not too short, which means it will work great for taller college kids. Twin XL beds can be used by many people. As you already know, they are great for tall teenagers and students. This mattress type is also suitable for taller adults who live in a limited space and cannot get a wider bed (but still need the length for their legs). To fit a Twin XL bed into a room, it should be at least 9 x 9 feet. Keep in mind that there’s also going to be some other furniture (probably) and you will need enough space to freely walk around the bed without bumping into the other pieces of furniture. Full mattresses provide a bit more leg room and some extra space for your arms without taking too much space in the room. Interestingly enough, this mattress size used to be the most common one for couples (a few decades ago, when the homes were usually built much smaller than these days). 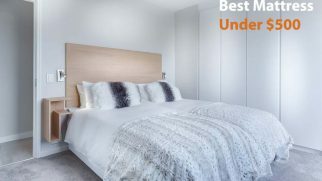 However, in more spacious modern homes, Full (or Double) mattresses are used primarily for children, solo adult sleepers (or someone who shares their bed with a pet), and couples who love cuddling and snuggling and don’t allow pets in their bed. It’s also a great option for a guest bedroom. To efficiently fit a Full mattress into a room, it should be at least 9 x 10 feet. It is suitable for smaller rooms as well but only if you don’t need that much free space to walk around. These days, Queen is the most popular and widely sold mattress size in the US. 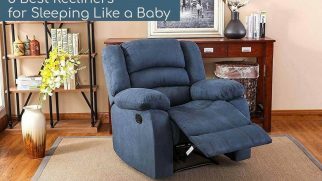 It is large enough to accommodate two adults but doesn’t take too much space in the room. Additionally, Queen mattresses oftentimes offer the best value for money. They come with extra inches for your comfort but don’t make you empty your wallet completely. 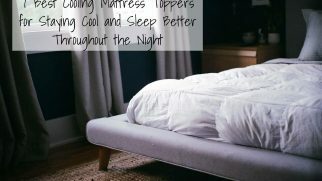 This mattress type is ideal for solo adult sleepers who prefer having some extra space, couples who prefer sleeping near each other, smaller master bedrooms, or guest bedrooms in large houses. It is also a great option for solo sleepers who sometimes (or always, because why not) share their bed with a pet. To nicely fit a Queen bed into a room, it should be at least 10 x 10 feet. However, the numbers will vary depending on how many pieces of furniture you want in your bedroom. People who prefer more free space around the bed (to walk around freely) should have at least 10 x 14 feet of room space. King isn’t the most popular mattress size, to be honest. Because these beds are quite large and heavy, they may be difficult to move around. However, King beds are quite popular among big families. This size has enough room for you and your partner, plus your kids (for instance, if they love to lie with their mom and dad in the mornings) and pets. So, those extra inches of width and length make the King size perfect for couples who require a lot of personal space or tend to sleep in a “starfish” position. This mattress type is also great for people with kids and pets. A quick note: King is the same size as two Twin XL beds placed side by side. So, if you and your partner have different comfort preferences, you can simply get 2 different Twin XL beds (with an ideal firmness and comfort level for each of you) and place them next to each other. To efficiently fit a King bed in your bedroom, it should be at least 13 x 13 feet. Why is it called California? Well, because in California, a regular King bed was actually 72 x 84 inches back in the 50s. I guess people in California really needed that extra leg space. Now, because Cal King is both wide and long, it is perfect for taller couples who need some personal space when they sleep. It’s also great for people who simply love stretching and spreading out in bed. This mattress size is also perfect if you occasionally share your bed with kids and pets. Cal King would also be a great solution if you have a very large bedroom and want to make it look less empty. To adequately fit a Cal King into a room, it should be at least 10 x 12 feet, but in this case, you will not get too much free space to walk around the bed. Now you are almost a mattress expert. The only thing left is to pick a mattress model, and you can have the bedroom of your dreams and the perfect sleeping environment. 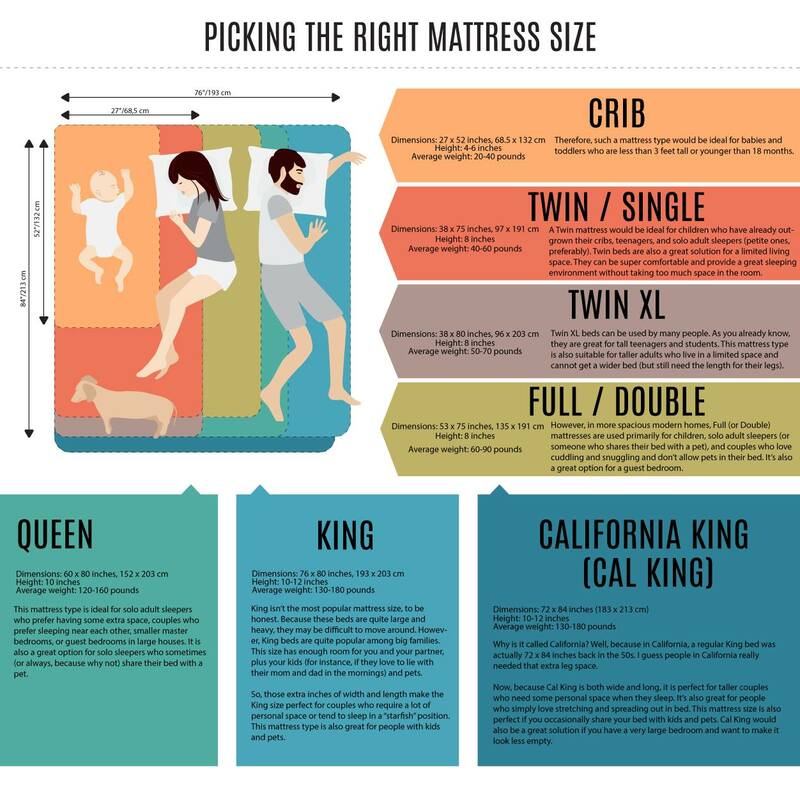 Which mattress size are you going to pick? What other plans do you have for your bedroom? Let us know in the comments down below!